Whoa, whoa, whoa. Did you think we were talking about signing up for Weapon X experiments? You don’t want to go through all that. They’ll try to melt some adamantium and graft it to your bones. Unless you have Wolvie’s mutant healing factor, it’s not going to go very well. 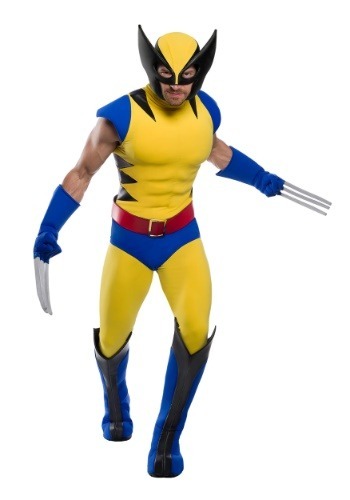 We were just talking about wearing this high-quality Wolverine costume, which is designed to look like his iconic outfit from the Uncanny X-Men comic books. This premium plus size Wolverine costume does an uncanny job of recreating his costume from the comics! (See what we did there?) The costume comes with a bright yellow top with a matching bottom. It has black spike patterns on the shoulders and along the sides. Blue shoulder pads and blue briefs add a pop of classic X-Men style to the look and the red belt makes you look ready for a rumble with Magneto. The costume also comes with a muscle insert, which can be worn under the top to make you look as buff as the Canadian mutant! The boot covers are a matching bright blue color, as are the gloves. 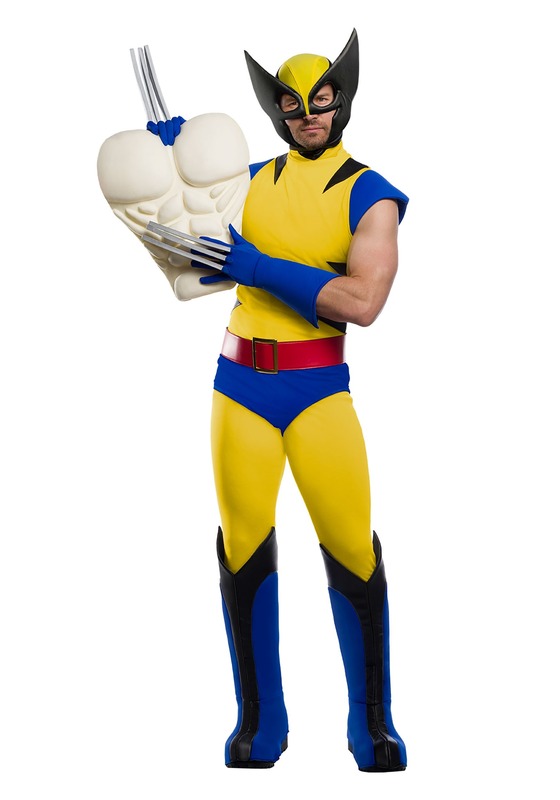 Of course, the gloves have attached claws on them, because what kind of Wolverine would you be without claws? The finishing piece to the outfit is the mask, which has the black pointed ears that are synonymous with Wolverine. You might not gain any new powers, but with your advanced knowledge of Wolverine and this officially licensed X-Men costume, you should feel fierce enough to face off against Magneto, the Hellfire Club, or even Sabretooth! Horrible, no sé parece en nada a la foto. Además de que la talla que llegó fue demasiado grande . ¡Siento mucho que no estés contento con el disfraz! ¿Se comunicó con el Servicio de Atención al Cliente para que lo devolvieran? Siempre pueden ayudar en situaciones como estas.